June 25 — We returned to our billets in Enschede and shortly after arriving Mac and Ronnie came for a visit. Ronnie is spending the night here. 6 FDS as we know it does not exist now, the boys are scattering all over the Country. The Unit has been notified that new Officers are chosen. Dibb and I are both gone, Mac goes next Monday — my draft papers have not come through yet, but I am expecting them daily. June 27 — Side Medina arrived here today, he will take over the Unit when I leave. Just received word to report to ADSM Army troops on Monday morning. Do not know what is in the wind. Am expecting Ronnie, Hans and Mac up tomorrow. Tonight there is an Ensa show here. Things are getting very monotonous. The Ensa show was very good. It has played to us in Worthing two years ago. Corporal T.C. Mackenzie, Sergeant R.W. Williams, Private N.E. Smith and Gunner H.D. Gugell, who all received Military Medals, at Buckingham Palace, London, England, 27 June 1945. LAC. June 22 — Gordie and I drove through to Zielst for the weekend. June 23, 24 — Spend time with my Dutch family and really had a grand time. They have been wonderful to me over here. Unidentified personnel of the cruiser H.M.C.S. 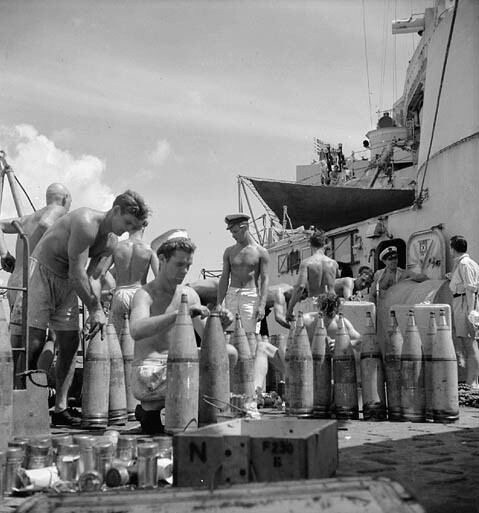 UGANDA setting shell fuses before the bombardment of Truk, Caroline Islands, 23 June 1945. LAC. June 21 — Finally left 6 F.D.S. It is not just a memory. Fred, Gordie and I started out early in the morning, drove to Apeldoorn, Zutphen, Lochem to Enschede where we joined 21 F.D.S. and I took over command. We are in the most beautiful billets we have ever been in — in a very beautiful town. We are not doing much work. Dibb goes back to Canada on Monday. Saw Freddie Jenner yesterday. He will be up to visit me on Monday. 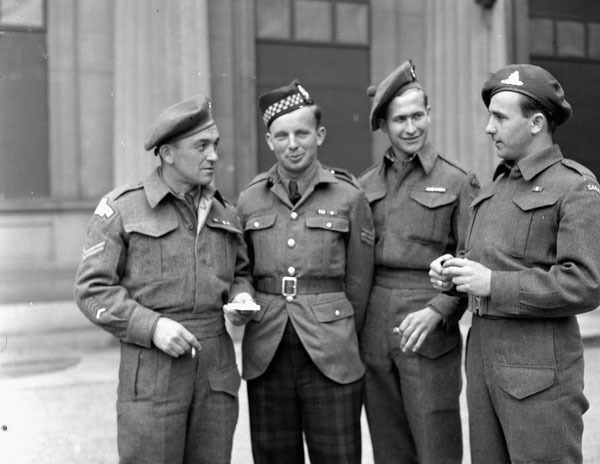 (Doc Alexander had been in command of the 6th Canadian Field Dressing Station since Feb. 19, 1944. He landed at Juno Beach with the 6FDS on June 27). 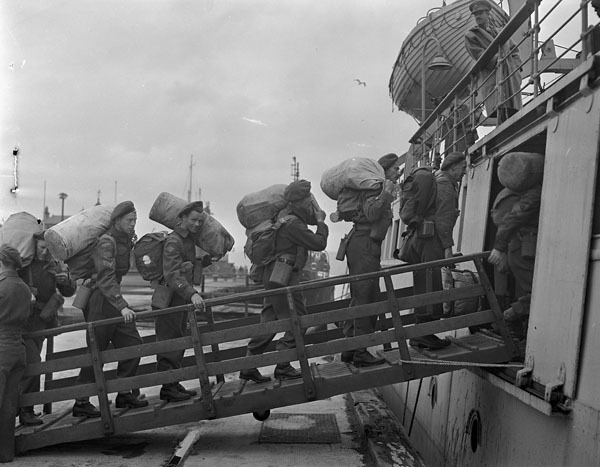 Canadian soldiers boarding a tender going out to a troopship en route to Canada, Gourock, Scotland, 21 June 1945. LAC. June 16 — Gordie and I left for Apeldoorn about 9 A.M. It is a lovely drive — 39 km. The Town itself is very lovely. I had to go on to Arnhem and report to #1 Gen Hosp. at Nijmegen. There I saw Col Goring and Mason Cooper. Returned to Apeldoorn and had an interview with Brig. Elder. I am being put on the first available draft for Canada. June 17 — Loaded my jeep with stolen articles from Germany and started for Zielst. We went down by way of Utrecht on a wonderful road, but the bridges over the Neder Rijin and Maas were out and we had to go over on ferries. The country just north of ’s-hertogenbosch is very badly knocked to pieces. Coming home we came by way of Nijmegen and Arnhem. We arrived home at 3:15 A.M very cold and tired. June 18 — General meeting in Amersfoort between Col Hunter the ADMS of Co F and the old and new OC’s of the 4th FDS who are being made over into Occupation Forces −5-6-7-10. I am being held on as OC for a few days. This afternoon, Ronnie, Staff, Gordie and I went on a long sightseeing tour and really saw this part of Holland. We drove to Amersfoort, then north west through beautiful country to Hilversum, known as the Hollywood of Europe. En route we passed through Soest, where the Queen has a lovely summer palace. Hilversum is very modern and is the most beautiful place I have every seen. From here we drove along the Ijsselmeer on Zuider Zee to Amsterdam — a very lovely drive. The Zuider Zee to looks like any other sea, but was very impressive with its hundreds of sail boats. Amsterdam is very nice, but I have never seen so many apartment houses in my life. From here we drove straight west right across the Penninsula to Haarlem, a short distance inland from the North Sea. In this area there was some evidence of flooding. We now drove south through the Tulip country to Leiden — unfortunately the season was over, but the Tulip fields were there. From here we went down the coast to The Hague, a very beautiful city. one large part of the city has been very badly damaged. Saw the Royal Palace, a very mean looking little house right in the centre of the City. From the Hague, we drove to Rotterdam, in my opinion the least likeable of any of the cities — not as badly damaged the Hague, but beaten up quite a bit. From Rotterdam to Gouda, from Gouda to Utrecht, a very lovely City, then to Amersfoort and home to Hoevelaken. A simply glorious trip, which really gave one some idea of the Netherlands. The reclaimed land is as flat as our prairies. June 19 — Capt. Green left this morning to assume the duties of RMO at a COF Btn. Paul Carson also left for Bruges where he will be married tomorrow. Dave McKenzie and Archie Hardyman and their four men moved this morning to #3 Can. Gen. Hosp. at Apeldoorn. This afternoon I hope to go to Doorn and visit the Calgary Regiment. I am just waiting for draft to England, so am enjoying myself. 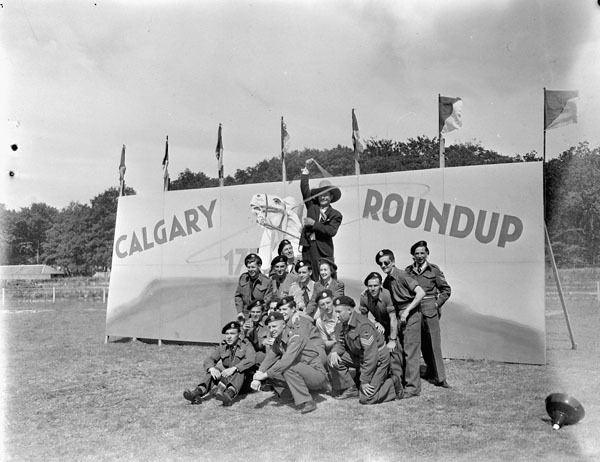 Entertainers and troopers of The Calgary Regiment in front of a sign reading “Calgary Roundup”, an event which included sports, entertainment, refreshments, and the presentation of a silver service to the regiment’s commanding officer, Apeldoorn, Netherlands, 18 June 1945. LAC. June 14 — Our advance party, consisting of eight vehicles and thirty men, left Bad Zwischenahn at 8:20 A.M. Gordie, Capt. McDonald and I lead in the jeep. We passed through Oldenburg, Cloppenburg, Meppen, Lengen, crossed the border into Holland, then through Hengelo, Lochem, Zutphen, Arnhem, Ede, Amersfoort, Hoevelaken, to a pasture where we are making our home. We left the convoy at Oldenburg and drove straight through Amersfoort to report to 3rd Div. H.Q. and by the time all the vehicles had arrived it was 9 P.M. We pitched the necessary canvas and called it a night. June 15 — Everybody busy erecting more canvas. We today have been notified that a bunch of reinforcements will arrive today and that the new O.C. will take over some time today. That sounds as if I may be starting on my way for Canada soon. The rest of the our Unit will be in sometime tonight. We are only about twelve miles from Utrecht, about six miles from the Zuider Zee, twelve miles from Hilversum, the Hollywood of Holland about eight miles straight north of Doorn. It is very lovely country here, but some of the children look pretty parched and starved. Amsterdam is only about thirty five miles from here. We hope to have seen the last of Germany. What a contrast here, everybody is friendly and the camp is already cluttered with children. Col. Hunter the CFO ADMS was down this morning. Very little news. Maj. Barr arrived this morning but did not take over the Unit yet. The main body of our Unit arrived about 5:30 P.M. All are now bedded down for the night. Seven reinforcements also arrived today. 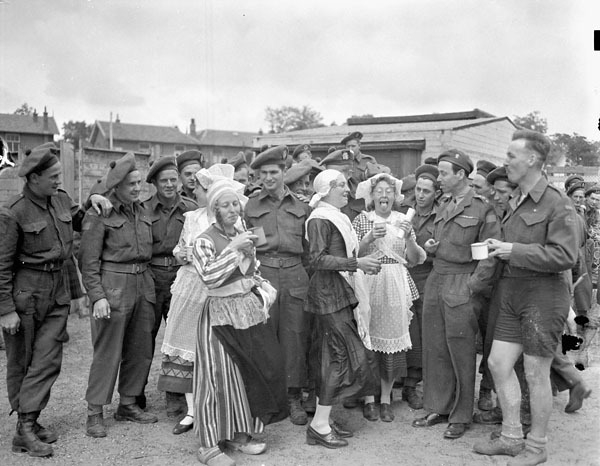 Just got word that Col. Elder wants to see me at Apeldoorn tomorrow, so will leave for there about 9 A.M.
Dutch women having tea with personnel of the 3rd Canadian Infantry Division during the Division’s Sports Day, Hilversum, Netherlands, 14 June 1945. LAC. June 12 — Pte Cooke and Cpl Rooney left today for Burma. Tomorrow Sgt. Sprecker, Cpl Chesnick and L/Cpl Nusti will also be leaving for Burma. Archie and I went over to 21 FDS — right outside of Bremen. It is a hospital in the middle of a large Russian Camp. Not an ideal place to be. They are closed now, moving out to Holland. On return I found our movement orders waiting. Our Advance Party leaves for the Utrecht district tomorrow morning. Our main body will leave on June 15. 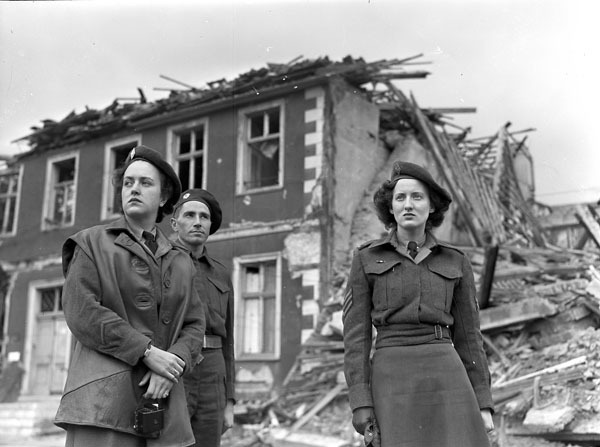 Members of the first contingent of the Canadian Women’s Army Corps (C.W.A.C.) 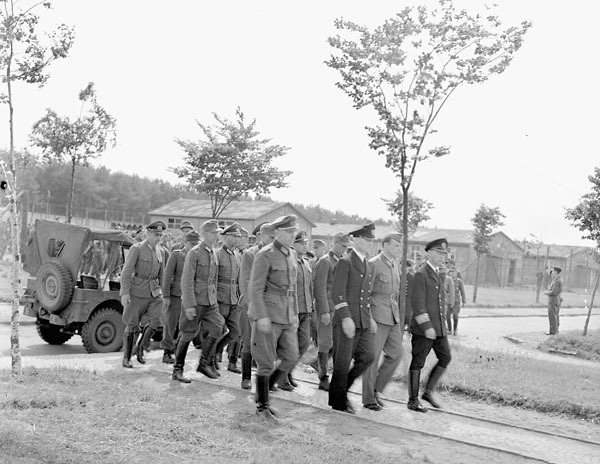 entering Hamm, Germany, 12 June 1945. LAC. June 13 — Our Court Martial case is being held this morning. Maj. McKenzie and I have to attend a Q Conference at Rear Corps. Corps are breaking up today, so this will be the last meeting I expect.